Dr. Blount joined Macquarie University in 2005. Before her academic career, Dr. Blount worked in senior management and consulting roles relating to information systems in the banking and IT sectors. Dr. Blount’s areas of expertise include anywhere working (telework, telecommuting), cyber security governance, e-governance, effective utilisation of information and communication technology (ICT) including social media and utilisation of ICT in learning and teaching. Dr Blount’s research program utilises multidisciplinary approaches to investigate how information systems are utilised to achieve organisational strategies and objectives. Dr Blount is the Research Coordinator for the Australian Anywhere Working Research Network (AAWRN). Dr. Blount is a member The Centre for Workforce Futures research centre and the Optus Macquarie University Cyber Security Hub. The combination of research and industry experience provides a strong foundation for teaching the real-world contexts of information systems. Dr. Blount is currently the Program Coordinator for the Master of Cybersecurity, Cyber Governance and Management Specialisation. Dr. Blount was Undergraduate Coordinator (2009-2012) for the Bachelor of Commerce, Professional Accounting, the Bachelor of Commerce, Accounting Major and Bachelor of Commerce, Business Information Systems Major. Telework and the implications for service quality. This project investigates how organisations implement a sustainable telework program that is sustainable and provides quantifiable benefits to the organisation. The integration of ICT in achieving learning outcomes. Blount, Y., Abedin, Babak, Vatanasakdakul, Savanid, Erfani, Seyedezahra. (2016). "Integrating enterprise resource planning (SAP) in the accounting curriculum: a systematic literature review and case study." Accounting Education: 1-18. Blount, Yvette, Tanya Castleman, and Paula M. C. Swatman. "E-Commerce, Human Resource Strategies, and Competitive Advantage: Two Australian Banking Case Studies." International Journal of Electronic Commerce 9, no. 3 (2005): 73-89. Parkes, Alison, Considine, Brett, Olesen, Karin and Yvette Blount. (2016). Accounting Information Systems Understanding Business Processes, 5th Edition. Milton, QLD: John Wiley & Sons Australia, Ltd.
Considine, B., Parkes, A., Olesen, K., Blount, Y., & Speer, D. (2012). Accounting information systems : understanding business processes (4th ed. ed.). Milton, Qld. : Milton, Qld. : John Wiley & Sons Australia, Ltd.
Huber, Elaine, and Yvette Blount (2014). "Second Life for Assessing Postgraduate Learning: Student Perspectives." Chap. 2 In Cases on the Assessment of Scenario and Game-Based Virtual Worlds in Higher Education, edited by S Kennedy-Clark, K Everett and P (Eds.) Wheeler, 36-73. Hershey, PA: ICI Global. Blount, Yvette, Tanya Castleman, and Paula M C. Swatman. "E-Commerce and Human Resource Management: Theoretical Approaches and Issues for the Banking Industry." Chap. 27 In Seeking Success in E-Business, edited by KimViborg Andersen, Steve Elliot, Paula Swatman, Eileen Trauth and Niels Bjørn-Andersen. IFIP — the International Federation for Information Processing, 485-501: Springer US, 2003. Abedin, B., Erfani, S. and Blount, Y., 2017, July. Social media adoption framework for aged care service providers in Australia. In Research and Innovation in Information Systems (ICRIIS), 2017 International Conference on (pp. 1-6). IEEE. Fakieh, Bahjat, Yvette Blount, and Peter Busch "SMEs And Cloud Computing: The Benefits To The National Economy And Global Competitiveness" 13th European Mediterranean & Middle Eastern Conference on Information Systems Krakow, Poland (EMCIS2016) 23-24th June 2016. Blount, Yvette, and Marianne Gloet. "Adoption of ICT Enabled Telehealth Services in the Australian Context: Implications of Technology Use for Telehealth Workers." Paper presented at the Hawaii International Conference on System Sciences HICSS-48 Kauai, Hawaii, January 5-8, 2015. Busch, Peter, Stephen Smith, Asif Gill, Pedro Harris, Bahjat Fakieh, and Yvette Blount. "A Study of Government Cloud Adoption: The Australian Context." Paper presented at the Proceedings of the 25th Australasian Conference on Information Systems, Auckland, New Zealand, 8th - 10th December 2014 2014. Blount, Yvette, and Margot McNeill. "Using and Evaluating Publisher-Supplied Software: A Case Study of an Undergraduate Unit." Paper presented at the 27th annual ascilite conference, Sydney, Australia, December 5-8, 2010. Huber, Elaine, and Yvette Blount. "Using Virtual Worlds Efficiently in a Post-Graduate Business Course: Designing an Exploratory Study " Paper presented at the 27th annual ascilite conference, Sydney, Australia, December 5-8, 2010. Blount, Yvette, and Tanya Castleman. "The Curious Case of the Missing Employee in Information Systems Research." Paper presented at the Proceedings of the 20th Australasian Conference on Information Systems, Melbourne, Australia, 2-4 December 2009. McElroy, Julie, and Yvette Blount. "You, Me and Ilecture " Paper presented at the 23rd annual ascilite conference, Sydney, Australia, December 3-6, 2006). Blount, Y, T Castleman, and P.M.C Swatman. "Approaches to Managing Employees in the B2c Banking Environment: Two Australian Case Studies." In Proceedings of the 12th European Conference on Information Systems. Turku, Finland June 14- 16 2004. Blount, Y , T Castleman, and P.M.C Swatman. "Linking Ecommerce and Human Resource Strategies: A Case Study in a Large Australian Retail Bank." Paper presented at the 16th Bled Electronic Conference, Bled, Slovenia, June 9-11 2003. Blount, Y "Electronic Commerce and Business Processes in Australian Banking: Implications for Employment Practices." Paper presented at the Graduate Students Consortium and Educational Symposium, 15th Bled Electronic Conference, Bled, Slovenia, June 20-21 2002. Blount, Y, T Castleman, and P.M.C Swatman. "Implementation of Electronic Commerce and Human Resource Management Strategies in an Australian Retail Banking Context." Paper presented at the Proceedings of the Seventh CollECTeR Conference on Electronic Commerce, Melbourne, Australia, December 2 2002. October 2017: Invited to convene an expert panel at the Sustainable Travel Choices Innovation programme (http://business2020.strikingly.com/) on Friday 20th October to facilitate a discussion on Anywhere Working. This event was hosted by Data61/CSIRO and future events will continue as a ‘Living Lab’. Transport NSWs have seven megatrends that will affect future travel. Megatrend number 3 is Live, Work and Study Anywhere. iTrack is an online mentoring program for high school students in Years 9 to 11. Students are matched with a supportive adult (other than a teacher or parent) who volunteers as a mentor and provides the student with general encouragement and advice and guidance about workplace, study and career opportunities. Students and mentors communicate over an 18 week period. Dr Blount studied for many years as a mature age student, undertaking a Bachelor's Degree, an MBA (Professional Accounting) and a PhD while working full time, and has empathy for students that have complex lives and need the support services to facilitate that learning. People learn in different ways and come from all sorts of backgrounds and it is important not to make too many assumptions about what students do and do not know. Adults also learn in many ways and have different learning styles so this also needs to be taken into consideration when reflecting on teaching and the learning environment. "I have been to both TAFE and university and it is always hard to find someone who is a good presenter and a good teacher. Yvette does both amazingly well. She is possibly the best teacher I have had throughout my tertiary studies. I wish I had her for every subject!" "Great teacher. It is good she changed careers to become a lecturer. A real asset for Macquarie University." "One of the best lecturers at Uni." Dr Blount believes that there should be a strong link between scholarship and research, industry/business and teaching that provides an effective learning environment for students to be able to make sense of the issues relating to information systems in a global and complex world. Dr Blount is continuing to develop a collaborative research network to examine sustainable anywhere working. A more comprehensive research agenda around anywhere working needs to be developed to help us better understand the trends emerging relating to the workplace of the future, specifically how anywhere working will transform the way we work, learn and live. Dr Blount is involved in research that investigates the issues relating to anywhere work and telehealth. The research examines clinicians engaged in various forms of Telehealth delivery, in order to explore the types of Information and Communication Technologies (ICTs) utilised in providing services, and how this impacts worker productivity, wellbeing and quality of service delivery to clients. Dr Yvette Blount from the Department of Accounting andCorporate Governance spoke on ABC North West Queensland Mt Isa Mornings about telemedicine and some of its teething issues. Comments by Dr Yvette Blount from the Department of Accounting andCorporate Governance went to air on ABC Western Plains Dubbo Mornings, ABCIllawarra Mornings, ABC Central West 17:30 News, and ABC Central WestOrange 12:00 News, regarding new research indicating that telemedicine hassome teething problems in that city specialists are often too busy toconsult regional patients remotely. Interview between reporter Nigel Freitas and Yvette Blount, regarding teleworking. She says organisation such as Cisco and IBM do teleworking very well, while many other businesses are behind the eight-ball. She does not believe the NBN is entirely necessary. She discusses trends and opportunities for businesses to embrace the technology, particularly in the SME space which she expects to expand significantly. Australian Broker Online wrote an article about teleworking, citing research developed through the Australia Anywhere Working Research Network and presented at the Digital Productivity in the Workplace of the Future Conference. Read the article "How to Telework Well"
"Macquarie University lecturer Yvette Blount, research coordinator for the Anywhere Working Research Network, says Queensland, Victorian and NSW governments are leading the way with research into the new centres." Excerpt: “We’ve been able to work from home since the ’70s. We need to change the conversation from working from home to anywhere working,” Blount says. The centres would be a boon for those travelling long distances into a CBD each day, such as the 40,000 NSW Central Coast residents who commute to Sydney and Newcastle. Blount was among the speakers discussing how Smart Work Centres could boost Australia’s low teleworking levels at the Digital Productivity in the Workplace of the Future conference in Sydney, on Monday. She is researching how such centres might be funded and run." Read the full article "Centres bring your job closer to home"
James Daggar-Nickson interviewed Dr Yvette Blount about the Telework and the importance of the NBN for teleworking. 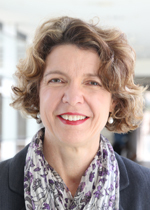 Dr Yvette Blount is the lead researcher for the Australian Anywhere Working Research Network (AAWRN), and speaker at the Digital Productivity in the Workplace of the Future conference. Excerpt: "Employees often see teleworking as a privilege rather than a right, so they want to make sure that this arrangement isn’t put at risk in any way, so often work longer hours" says Yvette Blount. Read the full article "Research Shows Teleworking has Revenue Benefits"
Excerpt: "People talk about increased productivity from working at home but … that does not necessarily translate to the rest of the team," Ms Blount, of Macquarie University's Faculty of Business and Economics, said. For instance, managers were often unsure how to manage people they could not see, she said. Staff based back in the office could also be wary of disturbing the person from home, and could get lumped with the more urgent tasks. "Organisations have to have a business case as to why they are doing it," Ms Blount says. "It has implications for customer service and the bottom line. [Teleworking] needs to be monitored, measured and properly evaluated." Read the article "Working from home: the pros and cons"
Excerpt: "It is important to have a formal review and make adjustments as you go, it is not a cookie cutter approach and it is not the same for every organisation." View article "What to do to make sure working from home works"
Excerpt: "The discussion looked at what the government is doing to encourage businesses to take up teleworking, what technology is required, how small businesses can get onboard, and what sort of organisations and people are best suited to teleworking." View article and video "Bringing telework into your business"